Once your invitation list is assembled and imported into your online Address Book, you may wish to send a 'Save the Date' eCard at least 6 to 8 weeks prior to your holiday event to ensure a great turnout. Step 2. In the Invitation Manager, create your event. Make sure you include all the basic information, and directions to the event if appropriate. I also recommend setting an RSVP cut-off date to get responses in a timely manner. You can always extend the RSVP date to be later if you need to. If you have meal choices or other questions that you would like to ask your guests when they RSVP, you can use the two optional multiple-choice questions that can be added to any invitation. If you have more questions or want more flexibility, you can create and send an online survey as a follow-up to the invitation, or include a link to both the survey and online RSVP form in the same eCard. A feature that I use often is to have CorpNote send me an email notification when someone responds. You can choose to have CorpNote send a cumulative email once a day, on days that you have responses, or to send an email notice each time someone responds. The latter option will include the guest's response details. Step 3. 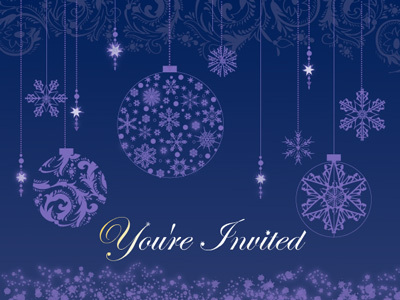 Compose your online invitation (with a link to the RSVP form) about 4 to 6 weeks prior to the event. You can choose CorpNote's eCard designs by selecting either the 'invitation' or 'Season's Greetings' category in the eCard search area, or you can create and upload a custom design of your own (view the tutorial: Custom eCard Designs). Step 5. Monitor Responses. You can follow your response progress on your account overview page or use the 'email response notification' feature when you set up your event in the invitation manager. If someone calls to respond or change their response, you can easily make this change by going to the 'Manage Responses' area for that event. The "Guest List", under 'Manage Responses,' contains everyone who has responded to your invitation. This area enables you to easily send an event reminder to all the people who replied they are attending and you can create Excel worksheets for attendance, nametags and more. Optional - After Party Follow Up. You can send Thank You eCards for clients or donors or any other important guests after the event by going to your "Guest List." Several of our members who use CorpNote for employee functions will send surveys that ask their guests questions about their satisfaction with the facility (which is helpful for future party planning) or ideas they have for next year's party. We love hearing from our members! Please let us know if you have any questions or if you have any additional ideas to add to this list. Enjoy your party planning!